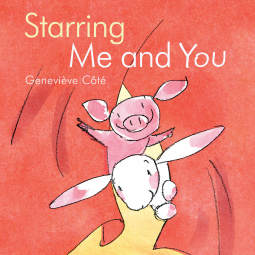 Today’s review is for Starring Me and You, by Genevieve Cote, published by Kids Can Press. It is scheduled for release on March 1, 2014. I received a free electronic copy of this book from the publisher, through NetGalley, in exchange for an honest review. Piggy and Rabbit are getting ready to put on a show–but Rabbit is feeling shy. Thus starts Starring Me and You, a picture book that shows pre-school aged children that there is more than one way to express emotions. As Piggy and Rabbit prepare for their show, they must confront their fears and figure out a way to work together. Cote has once again put together a beautiful picture book. I first discovered her work in the fall when I reviewed Mr. King’s Castle. The writing in this new volume is a clear as ever. She has a way of tapping into the emotions of children, and expressing them in accessible language. Cote uses a lot of repetition in her text to great effect. Every time one of the animals talks about how they act in response to an emotion, the other chimes in to share an alternate reaction. There’s a wonderful rhythm, too, even though there is (thankfully) no rhyming text. Her language demonstrates an understanding of the written word and of her target audience. The illustrations are done in Cote’s signature style. She uses mixed media to produce gentle, yet lively, images that are sure to charm children. The simple lines and gentle shading fit in nicely with the emotional theme of the book. The dominant color on each page is a rich salmon. It is inviting and warm, setting up an atmosphere in which it is safe to express oneself. Most of all, I enjoy the abundance of white space on the page. There is no need to fill the page with background, because background isn’t important to the story. Rather, by using a minimalist design, Cote emphasizes that this is a story that could happen anywhere; it’s universal. If you’re someone like me who appreciates attention to detail, then you’ll also enjoy the book design. In particular you’ll like that Rabbit’s pages use one font, a subdued san-serif typeface–while Piggy has a more stylized typeface that leans a little askance. The typography choices actually reveal a little about the characters’ personalities. It’s such a small thing, but it was used effectively to strong impact. This is a great book for caregivers who are looking to talk with their children about emotions. The message that there are many ways to express oneself is positive and affirming. It lets children know that just because they don’t experience an emotion in the same way as their friend, that it’s okay. It could also be used as a jumping off point to talk about healthy and unhealthy expressions. I’m giving the book 4 out of 5 stars. It’s got thoughtful writing, charming illustrations, and plenty of opportunity for discussion. 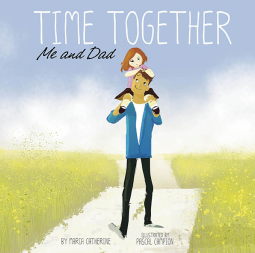 Today’s book review is for Time Together: Me and Dad, written by Maria Catherine, illustrated by Pascal Campion, published by Picture Window Books (an imprint of Capstone Young Readers). It is scheduled for release on March 1, 2014. I received an electronic copy of this book from the publisher, through NetGalley, in exchange for an honest review. Time Together: Me and Dad is a lovely picture book for children ages 2-6. It highlights the bond between father and child through a series of snapshots of special moments. It’s an excellent reminder that simple daily activities are the things that often build the strongest memories. Catherine’s writing is very simple. Rather than producing a narrative, she has chosen to present a series of moments to the reader. They range from “Quiet talking time” to “Wild ride time.” What I liked about her selection of activities is that they are varied and not mired in stereotypical gender roles. So, for example, Dad gets to participate in tea parties. It’s nice to see fathers portrayed as being involved in every facet of a child’s life. What makes the book really beautiful, though, are Campion’s illustrations. He has such a nice style–where he uses painting techniques in his digital compositions. Each image is a depiction of a father and child who are close, physically and emotionally, and engaged in an enjoyable activity. Every father and child pair is a little different. Some children are girls and some are boys. The families are from various racial backgrounds. It’s a quiet acknowledgement of diversity, subtle and not promoting any stereotypes. While the writing is a little thin, I do still think this book could have a place in homes and libraries. Even though there’s no real story, the book could be used to spark conversation about a child’s own experiences. Some discussion questions might be: which of the activities in the book did you like best? What are some of your favorite times with Dad? It would be a nice book to read for Father’s Day, as well, to celebrate the role of fathers in children’s lives. I’m giving the book 4 out of 5 stars because the book had lovely execution, and though it’s not a genre I usually enjoy, it pulled me in. 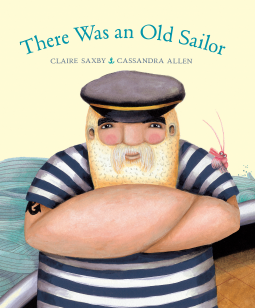 Today’s review is for The Was an Old Sailor, written by Claire Saxby, illustrated by Cassandra Allen, published by Kids Can Press. It is scheduled for release on March 1, 2014. I received a free electronic copy of this book from the publisher, through NetGalley, in exchange for an honest review. We’ve all heard the tale of the old lady who swallowed a fly–but did you hear the one about the old sailor who swallowed a krill? No. Well, you’re in for a treat. The remake of a familiar folk song shifts the story from the farm to the sea. Children will giggle and sing along as the old sailor swallows increasingly large sea creatures. Folk songs make for good toddler books, because parents don’t have to worry about not knowing how the song goes. But, sometimes, they also feel tired and dull. When you’ve sung something countless times, the craving to change things up can be intense. Saxby solves this problem by switching up the words. The struture, rhythm and rhyme-scheme of the original song remain intact, while the transition to a nautical theme is refreshing and fun. Her verse scans flawlessly, meaning that parents and educators won’t be left stumbling over misplaced beats or forced rhymes. Allen’s pencil and gouache illustrations are round, plump, and appealing. They are cute enough for toddlers to love, and detailed enough to keep their wandering eyes engaged. The sailor himself is the perfect balance between old salt and grandpa. The swirling waves of the ocean create a great sense of movement, and will make you want to sway in time to the beat of the verse. It takes a special talent to take something old and familiar and transform it into something new and equally enjoyable. I’m pleased that Saxby has such talent. This 4 star book is a great choice for parents who want to sing with their kids at home, or for librarians who are looking for something that will burn off some energy during story time. It also provides a great opportunity to talk with kids about marine biology, the food chain, and other nautical topics. You can find more information about this book at Goodreads. To be frank, after I read the second book, I wasn’t sure I wanted to finish the series. I felt like that book would have been more aptly titled “Prince Paulsen’s Epic Temper Tantrum.” The story fell flat for me. Fortunately, Princess Madeline and the Dragon wasn’t just better–it’s the strongest book in the series. 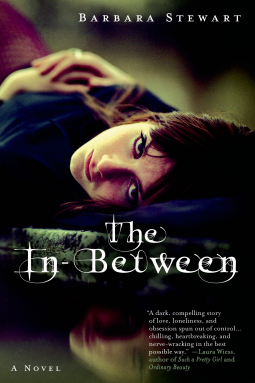 The writing was far tighter than the previous two books–in terms of both plotting and editing. It was nice to see all of these clues that had been dropped through the previous books all finally come together. There was less purple prose, more character development, and wider scope. In short, Pulioff really hit her writing stride. It was nice to see some character development in some of the secondary characters. Braden finally had a chance to shine–and the audience got to see him grow from an uncertain prince to a strong leader. Elias was given an even more prominent role, which I enjoyed. Princess Madeline is alright, but I was always most intrigued by the wizards. Even Sophia was given more agency; instead of just being Braden’s kissing partner and Madeline’s maidservant, she had the opportunity to make decisions for herself. Which connects to why this was my favorite book of the series: it wasn’t all about Princess Madeline this time. She was still the protagonist, of course. But there was so much more going on–history, decoding prophecy, transitions, dragons. There was more at stake than who Princess Madeline would have to marry. And that made me feel more invested in the outcome. I’ve decided to give the final book 4 stars. It has an engaging story, good world-building, and dynamic characters. Even though I’m not personally a big fan of romance, I think that it’s written in a way that will appeal to middle grade girls. I also appreciate that Daniel is never rude or condescending or otherwise engaging in misogynistic behavior–it’s a refreshing change from heroines falling for the arrogant show-off or the “misunderstood bad boy.” If there’s got to be romance in the story, I’m thankful that it’s modeling a healthy relationship to girls. When you think about fairy tales, what stands out most? The charming story-line, the medieval settings, the magical elements and enchantments? For me, the beauty of the fairy tale revolves around the princess. Pretty, perfect, sweet and demure, the princesses of traditional fairy tales have problems that need to be solved. Maybe it’s something with their sweet nature, or the simple desire for good to triumph, but I am easily swept up in the journey to find that happily ever after. Let’s take a look at some of our favorite princesses and what makes them so memorable. Snow White is considered the perfect princess. She is unassuming in her demeanor, sweet, calm, and naïve. Her dreams of love are inspiring, and her gestures of kindness make everyone love her and protect her in return. This is a story about love conquering all. Cinderella is another classic tale. This is the perfect rags to riches story, as a normal girl finds her Prince. Growing up neglected and abused, it is amazing that she remained as sweet natured as she was. She’s proof that friendship is everywhere around you, even in the animals, and that dreams can come true. Ariel is one of my favorites. I loved The Little Mermaid for many reasons, but especially for its turn away from the “perfect princess.” This story is an example of teenage rebellion at its finest. Ariel still stands out as beautiful, talented, and royal… but she is also spoiled, disobedient, and headstrong. She shows you how following your heart comes with risks but also the greatest rewards. Princess Madeline is a modern take on the traditional fairy tale. While she certainly has some traits similar to the other princesses, beauty, charm, and strength, she also has a bit of rebellion and stubbornness thrown in. Balancing a blend of hard and soft qualities, Princess Madeline finds a way to show both strength and vulnerability as she learns lessons about growing up, the dynamics of relationships (family, friend, and love), and finds her inner strength. So, if you like Disney princesses (and who doesn’t)*, and are looking for a new book, then Princess Madeline series may be a good choice for you. 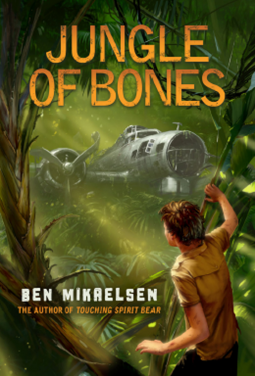 Today’s book review is for Jungle of Bones, by Ben Mikaelsen, published by Scholastic. It is scheduled for release on January 28, 2014. I received a free electronic copy of this book from the publisher, through NetGalley, in exchange for an honest review. Dylan Barstow has a chip on his shoulder the size of Texas. Ever since his father died, he keeps getting in trouble. But when he steals a car from the junkyard to spin donuts in a field, his mother gives him an ultimatum: spend the summer before 8th grade in lockup or spend it with ex-Marine Uncle Todd. Reluctantly Dylan chooses Uncle Todd. Soon he discovers that Uncle Todd has bigger plans for the summer than early morning jogs–they’re going to take a trip to Papua New Guinea to join a team of 3 other people in search of the wreckage of WWII bomber Second Ace. When Dylan gets lost in the jungle, he finally has to confront the realization that he is not the center of the universe. If he wants to survive, he’s going to have to abandon his assumptions and anger. Recently I realized that I’d need to push myself to read outside of my “comfort genres” in order to better serve my audience. The synopsis for this title sounded interesting, so I decided to give it a try. It turned out that the story was so engaging, I stayed up well past my bedtime to finish the book in one sitting. It was the descriptions of Papua New Guinea, the jungle and the struggle for survival that really hooked me in. They were skillfully written. I could imagine the smells and the oppressive humidity. I could picture the shanties and villages. Everything felt so vivid, alive and alien. That sort of powerful description can be hard to master. Some writers over-do it, using purple prose and redundant adjectives. Mikaelsen nails it, though. Sometimes it is hard for me to get into a book when I don’t really like the main character. And I did not like Dylan very much. That said, I knew him (because he was so much like other young men I’ve met in my life) and I cared about him. He was completely self-absorbed, disrespectful, and a real pain in the behind–but I could also recognize the pain underlying his behaviors and wanted for him to heal and move on with his life. I could have done with a little less of the heavy-handed jingoism, though. The military history in the story was wonderful. In particular, I found the journal entries in the journal of Dylan’s grandfather to be well-done and informative. I also liked when they visited a veteran in a nursing home and got to hear his story. However, there was also a tone of military worship to the book, and a bit too much “The USA is the savior of everyone” attitude (as though Dylan’s uncle forgot that there were other countries fighting alongside the United States in World War II). In the final assessment, though, I was able to get passes my discomforts and enjoy a well-crafted story. I liked how it encouraged inter-generational relationships, emotional healing, a respect for history, and valuing cultures that are vastly different from one’s own. It’s a great book for young people who enjoy the genres of adventure and survival. It might also be a good selection for young people who are lashing out at the world after dealing with a traumatic life event. I’m giving the book 4 stars. Today’s book review is for Mommy and Me Start Cooking from Dorling Kindersley. I received a free electronic copy of this book from the publisher, through Edelweiss, in exchange for an honest review. Mommy and Me Start Cooking is a wonderful first cookbook for school aged children. In addition to introducing children to basic cooking techniques, it also includes detailed information on a number of ingredients. The bold design and use of infographics make for a book that is sure to engage children and get them excited about being in the kitchen. The first thing that I noticed about this book was the great design. It’s quite visually appealing. Text is presented in fun, kid-friendly fonts that are still easy to read. Illustrations combine elements from photography, clipart and traditional illustration to create a lively visual environment. Most of all, though, I was drawn to the infographics. Infographics such as charts and diagrams make it easier for kids to process new information. Instructions are provided in text, with accompanying photos so children can understand the actions described. There are even warning triangles to indicate steps that should be done either by an adult, or under adult supervision. I was really impressed by how thoughtful the designers were in putting the book together. The recipes cover all three meals of the day, as well as snacks and desserts. I appreciated the range provided. As a vegetarian, I also appreciated that efforts were made to suggest alternatives to meat in some of the recipes. I was most intrigued by the recipes for star cookies, blueberry sponge, and pea houmous. The star cookies incorporate ginger and orange zest to make them special. Using peas to make houmous was a novel and appealing idea. My only real complaint about the recipes is that I wish they incorporated more vegetables. Getting children to eat vegetables can be a challenge for some parents–but I think if they were encouraged to help in their preparation it might help. This cookbook offers ample opportunities for teaching moments. There are asides about various ingredients that explain where they come from, how they are harvested, etc. Measuring ingredients for the recipes helps kids develop math skills. For an extra challenge, you could figure out how to double a recipe to serve more people. After observing how ingredients combine and transform, children could read about different aspects of food chemistry. A child interested in geography could research where various crops originated. Or you can simply enjoy learning the basic life skills of food preparation, and enjoy consuming the fruits of your labor. Mommy and Me Start Cooking is sure to engage children and teach them to appreciate home-cooked food. With great design, fun variety, and age-appropriate content, this book earns 4 stars. And the recipes are simple enough that even parents who lack culinary savvy should be able to execute the recipes with their kids. You can find more information about this book on Goodreads. 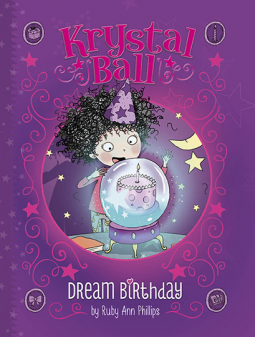 Today’s book review is for Dream Birthday, by Ruby Ann Phillips, published by Picture Window Books (an imprint of Capstone Young Readers. This book is scheduled for release on February 1, 2014. I received a free electronic copy of this book from the publisher, through NetGalley, in exchange for an honest review. Krystal Ball is a fairly typical fourth grader, except for one thing. She’s a fortune teller. She’s great at predicting the future, but she’s not always so good at interpreting her visions. Her birthday is coming up and she’s ready to have an amazing party. The problem is, she keeps having horrible nightmares. In this installment of a new series for 6-8 year olds, Krystal will learn that even things look grim, there can still be a silver lining. Phillips does an excellent job in her first person narration of capturing the voice of a nine-year old girl. Initially, I was unsure about whether I liked the narrative style–but as I read more, I realized that it was perfect for the target audience. The voice was believable, friendly and inviting. It is crafted in such a way as to engage young readers and draw them into the mysteries of the story. I enjoy that Krystal has solid relationships not just with her parents, but also with her grandmother. The multi-generational aspect of the story was nice. Even though Krystal has a special gift, she needs the guidance of her grandmother to understand how to use it. I also like that even though her parents don’t have any psychic abilities, they are understanding of their daughter and encourage her to spend time with her grandmother. For an early chapter book, I actually found the plot pretty engaging. As a reader you get to see the visions that Krystal has. Which means that you also have the opportunity to try to puzzle out what they mean. Even when you suspect the answer, chances are it’s not going to be quite what you thought. This is exactly the sort of book that I think I would have enjoyed as a young girl. I remember being fascinated with fortune telling and astrology at that age. And Krystal is such a likable character. I could easily see her being someone’s go-to “book friend.” I’m going to give Dream Birthday 4 stars for fun concept, engaging plot, and appropriateness for target audience. 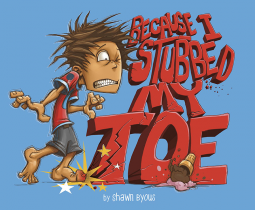 Today’s book review is for Because I Stubbed My Toe, by Shawn Byous, published by Capstone Young Readers. It is scheduled to be released on February 1, 2014. I received a free electronic copy of this book from the publisher, through NetGalley, in exchange for an honest review. Because I Stubbed My Toe is a hilarious take on the butterfly effect theory for the 5-7 year old set. One morning a boy stubs his toe, which sets in motion a wild chain of events including a bike dash, an elephant dash and more. By the end, the boy has a sore toe, a treat, and one heck of a story to tell. The writing style is a lot of fun. Each page leaves you hanging with a lead-in to the next part of the chain reaction. It’s a great way to draw kids into the story and keep their interest. I think that it’s a particularly effective technique in this book, because the events that transpire grow increasingly ridiculous. The language used is direct and age appropriate, with a nice variety of verbs. The illustrations add a lot to the story. My favorite part about them is that the background is presented in muted grey tones, while the primary action for each page is vibrantly colored. It creates a greater sense of depth and dimension in the illustrations, without detracting attention from the focal point. The overall style is cartoonish, which complements the action and absurdity of the story. Drawings were hand rendered, and then digitally colored. Original sketch lines were not fully erased, which creates a sense of movement within each image. This a great book to introduce kids to ideas like cause-and-effect or chain reactions. It might also be used to explore unintended consequences–sometimes we don’t mean to do something, but our reactions still result in that outcome. On the other hand, it’s also a book that can just be enjoyed as solid entertainment. It’s a great choice for a reluctant reader with a great sense of humor, too. I’m giving the book 4 stars for entertaining story, lively illustrations, and solid book design. 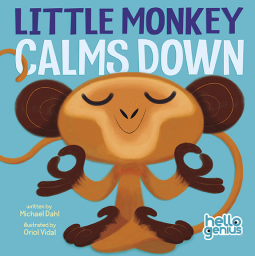 Today’s book review is for Little Monkey Calms Down, written by Michael Dahl, illustrated by Oriol Vidal, published by Picture Window Books (an imprint of Capstone Young Readers). It is scheduled to be released on February 1, 2014. I received an advance electronic copy of this book from the publisher, through NetGalley, in exchange for an honest review. Little Monkey Calms Down is a board book for children ages 2-4. Little Monkey has a meltdown when his day isn’t going as planned. However with some soothing words and useful coping strategies, Little Monkey is able to calm down and enjoy the rest of his day. This book teaches toddlers how to express and manage their emotions, which is an important skill. Dahl’s writing is simple, clear, and age appropriate. He uses plain language that helps children to focus on the key ideas of the text, rather than getting bogged down in unfamiliar word choices. I appreciated that he emphasized that you can feel more than one emotion at the same time, such as sad and mad (although, I was puzzled by the inclusion of angry, being that mad and angry are usually used synonymously). Most importantly, though, he reassures kids that it is okay to cry–while also offering them techniques to calm themselves. Vidal’s illustrations are bold and colorful. Every page has a flat background of saturated color that draws the eye. And his rendering of the monkeys is wonderful. Little Monkey displays a wide range of emotion, illustrated so that even the youngest children can read the visual cues and understand how he is feeling. Vidal works in a style that I also think will appeal to toddlers–one that is cute and lively. This is an excellent choice for parents who want to encourage emotional awareness in their children. Learning how to regulate their emotions is an important developmental milestone for children–and it’s not something that they can do on their own. They need adults to guide them and provide them resources. At the same time, sometimes we parents also need resources to help guide us. Little Monkey Calms Down is a great solution–it provides children an opportunity to learn and parents a place to start dialogue. I give it 4 out of 5 stars.